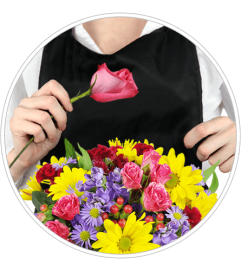 If ever there was the perfect bouquet with which to say "I Love You," our Love Blooms would take the cake! 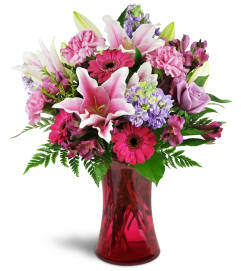 Bubbling over with white oriental lilies, feisty snapdragons and lively pink roses, this bouquet will touch the heart of that special someone like no other - or make that birthday one to remember! 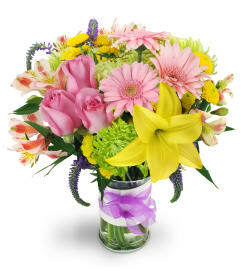 This lush and lovely arrangement comes in an elegant glass vase - a gift in itself! 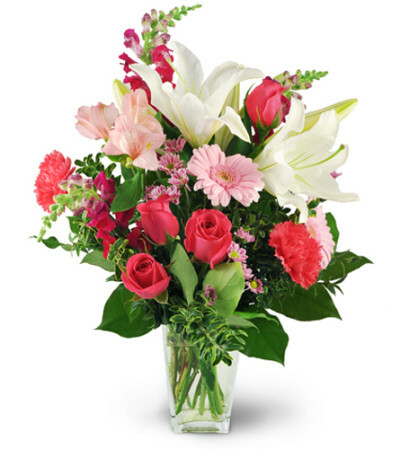 Stunning white oriental lilies and pink roses are beautifully arranged with carnations, mini Gerbera daisies, snapdragons, alstroemeria, and chrysanthemums in a tapered glass vase.